The promotional tour for Avengers: Endgame is currently underway and Brie Larson had some choice words for Thanos actor Josh Brolin at a recent stop. Brolin is currently on set in Jordan making Dune with Denis Villeneuve and is not involved in the Endgame press tour, though he did send out a warning to his co-stars last week when he posted a picture of the Infinity Gauntlet and told him he would tell them all of their futures after their interviews when he slips the gauntlet back on. Larson must have seen this warning and had the perfect response to it. At an Avengers: Endgame press stop, Brie Larson was asked if she had any scenes with Josh Brolin or if she talked to him on the set. Marvel Studios is keeping a tight lid on things and the actors and actresses in the movie are having a hard time keeping spoilers from getting out or saying the wrong thing. However, Brie Larson seems to be doing just fine. When asked about Brolin, Larson simply said, "I don't know, but I think he should be scared," and calmly place the microphone down. A subtle mic drop. Robert Downey Jr. was sitting next to Larson when she said her remarks and exclaimed, "Yes! Right, he should be!" Brie Larson delivered her answer in a calm and confident manner while RDJ was ecstatic. Larson is teasing the main battle with Thanos in Avengers: Endgame and playing off of her character's ego and bravado. We've only seen clips of Carol Danvers interacting with Earth's Mightiest Heroes, but she is confident she can go take down the Mad Titan on her own. Avengers: Endgame is going to see the survivors reteaming and trying to reverse the Decimation, which sounds easier than it is. There have been talks of time travel through the Quantum Realm to retrieve the Infinity Stones, but it has not been confirmed how all of this will go down. The Russo Brothers, screenwriters Christopher Markus and Stephen McFeely, and Robert Downey Jr. promise that fans have no idea what's going to happen when Endgame hits theaters in a few weeks. There is a lot of speculation, but has anyone figured it out yet? The Russo Brothers and Marvel Studios are doing a lot of hard work behind-the-scenes to ensure nothing leaks out about Avengers: Endgame. With that being said, we know they are screening 20 minutes of the movie in certain areas and as the release date gets closer, spoilers are going to be out everywhere in a matter of days. So, it might be a good idea to stay away from certain social media sites for the next few weeks to avoid having anything spoiled for you. 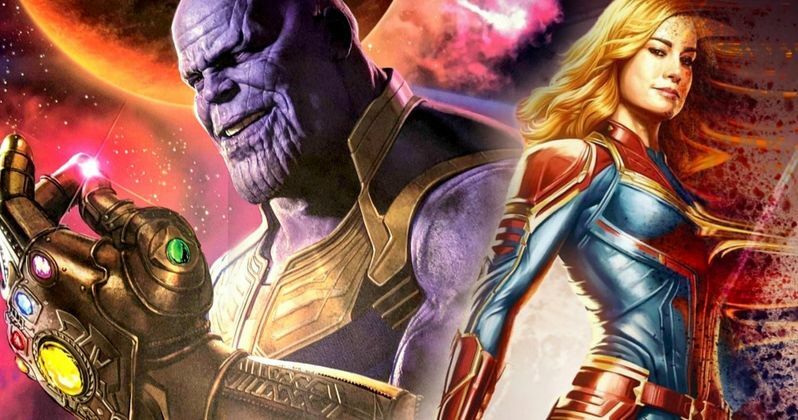 In the meantime, you can watch Brie Larson intimidate Thanos below, thanks to the Captain Marvel News Twitter account. BRIE - " I dont know but i think he should be scared."